Renault India has finally launched its Nissan Sunny based sedan, Renault Scala. The car is certainly a wonderful work of art. The stunning exteriors along with sound engine specs give it a perfect appearance. The interiors of the car are also well-done thereby making it quite impressive. Renault Scala has been launched in both diesel and petrol engine options. The Renault Scala RXL is the base diesel variant of the sedan, which is loaded with numerous features and dynamic engine. Under the hood, Renault Scala RXL is equipped with a 1.5 litre of diesel engine that is capable of producing high power of 85PS along with 200Nm of maximum torque. The five speed manual transmission coupled with the engine ensures the car to give out impressive mileage that would help keeping your budget is under control. Renault Scala RXL is also an impressive performer on road and makes sure that the zooms away with utter smoothness and great speed. The interiors of the car are no less as they are loaded with numerous comfort features. the car variant has it all, ranging from efficient air cooling system, power steering, power windows, to ABS, EBD, airbags, and more . 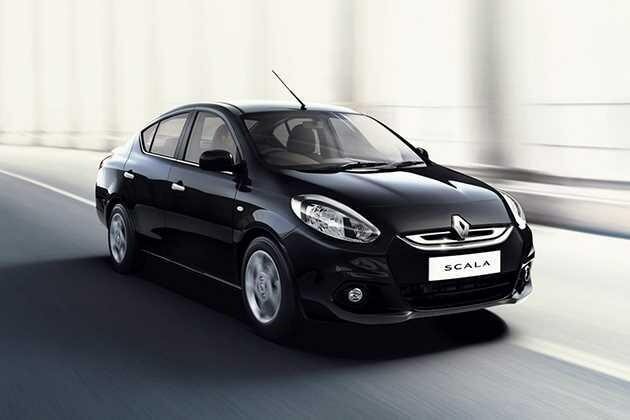 Coming o the looks of the new Renault Scala Diesel RXL , they would certainly keep you mesmerized. Renault India has done quite a lot of work on the exteriors of the car and made it spectacular. The car sedan is filled with some nice and clean detailing on the outside and provided the sedan variant with a unique and chic looks. The front end of the sedan has a much styled out bumper that comes along with the eye-catching grille and bold and swept back headlamps. The rear profile of Renault Scala RXL is chic and premium and comes with trendy and neatly done tail lights. The turn indicators are incorporated on the side ORVMs and the body colored door handles add to the entire look of the sedan. On the whole, the looks and appearance of the new Renault Scala RXL are up-to-the mark and maintain the style that is required to make you stand out amongst the crowd. The interiors of the Renault Scala Diesel RXL have been done with extreme elegance and sophistication. Renault India understands the overall importance of the interiors and provided the sedan variant with elegant and chic interiors. here, you would find dual tone interiors that comprise of high quality of fabric used for the seat upholstery, air cooling system with heater, well placed AC vents, central locking system, power windows, fabric inserts on the door trims, floor mats and so on. The ambiance inside the car is very premium and lavish. With such luxury, the cost of the Renault Scala RXL has been kept competitive. Therefore, you could get class interiors in Renault Scala RXL at a very reasonable price tag. The comfort level of Renault Scala Diesel RXL is quite good. This Scala seda is loaded with numerous advanced comfort features, which would make your ride in the sedan utterly comfortable and delightful. The sedan could easily adjust five adults and comes with the armrest for the rear seat passengers along with the cup holder. The manual adjustment facility for the driver seat and electrically handled ORVMs adds on to the overall comfort . The dash in the front is incorporated with a CD/Mp3 player with four speakers, which would convert your journey into extremely congenial and enjoyable. The electric power steering is smooth and is mounted with an audio control to amplify the overall comfort for the driving. The luggage compartment is very huge, while the headroom and legroom is ample for all the passengers. The Renault Scala RXL is the base diesel variant in the Scala range. The car is well-resourced in every department. The engine section is also well to do. Under the hood, the sedan variant comes with a very dynamic, robust and aggressive 1.5 litre of diesel motor. This diesel engine is capable of churning out maximum power of 86BHP along with peak torque of 200NM. This motor is united with a responsive and smooth five speed manual gearbox, which assists the sedan to deliver an awesome mileage of 16.95kmp l. Renault Scala RXL is a rear wheel drive, therefore, when accelerated the car is catches up an impressive top speed and goes from 0 to 100 km per hour in just 13 seconds . Overall, the performance of the car on road is remarkable and outstanding. The braking and handling of the new Renault Scala RXL is quite inspiring. The suspension system of the sedan is smooth and imposing . It comprise of McPherson strut on the front along with torsion beam on the rear. The braking system includes disc brakes on front and the rear has drum brakes . The handling of the car isn’t a disappointment at all. The car has smooth and classic power assisted steering wheel that has a turning radius of 5.30 meters. Along with this, the anti lock braking system is also present that keeps the wheels from locking up whenever emergency brakes are applied. All these features help making the handling of the car quite stirring. The safety department of the freshly launched Renault Scala RXL is top notch. Renault India has tried its level best to bless the car variant with all the crucial safety features. The ABS or anti-lock braking system accompanied by the electronic brake distribution system that gives a complete control of the car to the driver during the drive. The dual SRS airbags for the driver and front co-passengers make sure that they are safe in case in any accident or collision. The fog lamps on the front are fitted to certify that the driver gets the best driving vision even in rainy or foggy season. High class looks, comfortable and chic interiors, good safety features and most importantly the top-class mileage.